This is the time of year when many cultures celebrate our link with those who have gone before. 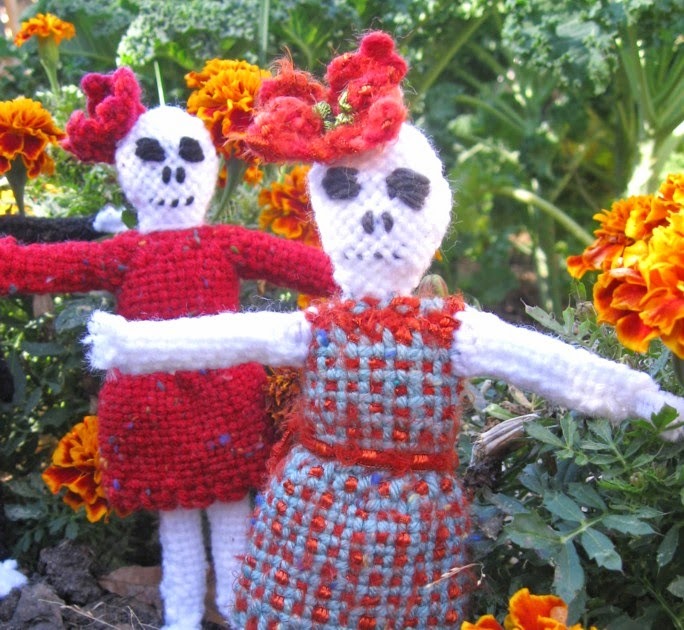 These pin loom dolls are intended to represent Day of the Dead figures. I posted them among the marigolds because this autumnal flower is closely associated with the celebration. the skeleton is what is left after the body has decayed. So the skeleton is used to represent the person's spirit or soul, in other words, that which remains after death. Day of the Dead or Día de Muertos decorations often feature this representation of spirit celebrating all the different aspects of life. 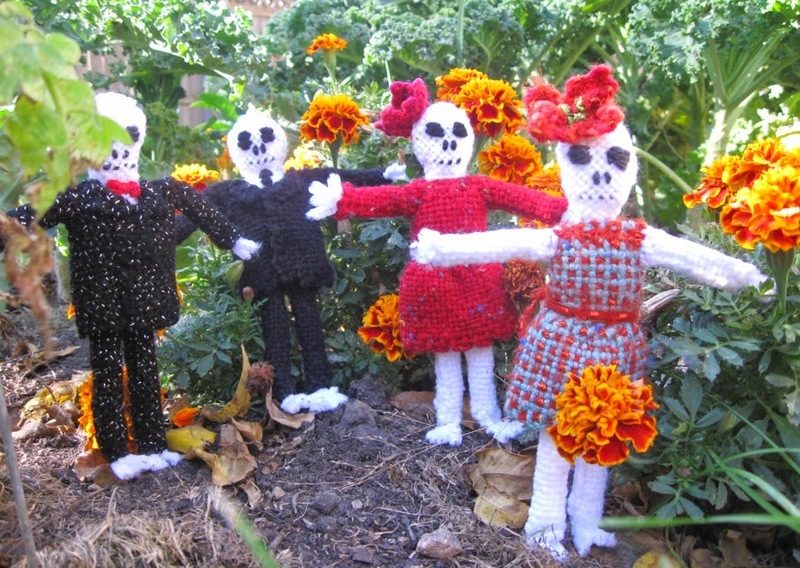 Check out this site for a variety of craft ideas for a Day of the Dead celebration. If you have the book, Pin Loom Weaving, you may recognize the doll figures here updated with suit coats and skirts as well as skeletal heads. The (slightly fuzzy) bony hands and feet were accomplished by adding short pieces of chenille sticks to the ends of arms and legs. Don't these guys look like they're posing for an album cover? The very best to everyone for Halloween, All Saint's Day, All Soul's Day and Dia de Muertos. I love the idea that almost anything is weavable on a pin loom. Here are two of my most recent experiments. We're coming up on the holidays and I have been looking at the multitude of spun and woven fibers intended for scarves with the intention of making some pretty little bags for the holidays. I think they would be great as part of a gift or as the basis for a holiday purse. I found this particular fiber in a "Please get this out of our store" bin. It is flat and ribbon-like with a generous amount of gold colored fiber woven through. So the question becomes, can you weave with it on a pin loom? The sample you see to the left was woven with two layers of the gold fiber and two layers of a wool sock weight yarn. I found that it was best to roll the fiber against my leg just before laying each 4" piece between the pins in order to turn it into a rounder package. I don't think it makes any difference to the outcome, but that made it easier to wind on. I always wind on the difficult fiber first and weave through with something easy to handle. As you can see this produces a wider shiny stripe of gold and with a smaller stripe of white. I think that it would be possible, but not easy, to wind on three layers of gold and then just weave through with the lighter wool yarn. I think it would be possible to wind and weave all four layers in the gold fiber but the effort, for me, would not be worth the tremendous amount of difficulty. As I may previously mentioned, I am fond of shopping at thrift shops because the items are so interesting. They represent a cross section of American passions over the past thirty or forty years. I don't know that I can call this particular item a passion, perhaps more an infatuation, a reflection of an earlier age that introduced the slogan "Better Living Through Chemistry". From that earlier time I found one skein of a very weird yarn. It looks as though it is made from exactly the same stuff as pantyhose. I did a search online and found another person who had discovered a skein of this stuff, but it was white rather than brown. A newer version of this yarn is listed as "slipper and craft yarn" which makes sense because it is very hard to the touch and might work well for knitted slipper soles. Comments in Ravelry notes the hard, scratchy feel of anything that is made out of this yarn, noting that it is extreeeemly durable, seemingly impervious to wear. There are 40 year old slippers still out there that were made from it. Of course, that may have as much to do with the fact that the slippers were so uncomfortable that they never had a chance to wear out. There is no twist to it, so it splits very easily-- not quite such a problem for me as for a knitter, but still difficult to work with. The greater difficulty for me was that the yarn was a little too thick to comfortable weave on my 4" pin loom. I finally wove two squares on a Weave-it 5" rug loom which I crocheted together to make what appears to be an impermeable pot scrubber-- which is shown above. ﻿Have you run into some strange fiber that has offered an unexpected gift? What unknown or underestimated fiber is out there, just waiting to share its gifts? Please share your experience. My intention, metaphorically, is to spin flax into gold, to show each fiber in its best light. Though the existence of Slender Man continues to be in doubt, no matter what every tween I've talked to asserts, I now have photographic proof of the existence of the Slender Man pin loom doll. As you can see below, this poses a terrible risk to play families everywhere. Due to the fact that I live in a creepy old house, I mean, a creepy classic house, once I started looking around, it proved surprisingly easy to discover the Slender Man doll in its preferred environment. Give a Slender Man doll to someone you love for Halloween... or perhaps someone you're stalking. Use the basic pattern for doll making found in Pin Loom Weaving; 40 Projects for Tiny Looms with body in white. Make the body element longer by adding crochet to top and bottom of the square only. Embellish with black yarn satin-stitch necktie. Add a suit jacket by wrapping a 4" x 6" black weavie around the body, stitch closed at shoulders and fold back at neck to create collar. Substitute two crocheted "tentacles" for the arms. To make each tentacled arm, chain 18, sc5, hdc10, dc3 and attach at the shoulder. Wishing everyone the very best for a super creepy and frightening Halloween!